Well, I’m back on the soapbox again, but from another angle. Paranormal romances are still going strong. Publishers request it—but what stories do they actually want? If science fiction romance counts as a paranormal romance, why aren’t we seeing more of these stories? Even if defining cross-genre books like SFR as paranormal romances is only for the purpose of the submission process, it sends a mixed message at best and misrepresents a publisher’s intention at worst. It creates a rut for SFR in that authors (published and aspiring) who might write SFR don’t because publishers say one thing and do another. SFR and other types of paranormal romances are not mutually exclusive. Just because chocolate sells like gangbusters doesn’t mean strawberry ice cream won’t sell well, too. 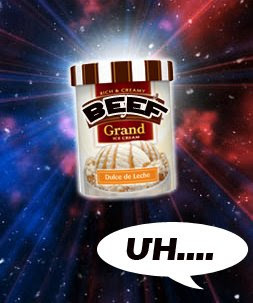 SFR is closer to strawberry than to some esoteric flavor such as beef stew ice cream (check out my comment for that post while you’re there). So why the differences in how SFR submissions are treated? One issue I see is that horror-based paranormal sells well because somewhere along the line, the horror was removed from the equation. There are some great stories, but frequently, the horror element that differentiates them from traditional romances has largely been tamed to the point of being unrecognizable. Therefore, my guess is that publishers tend to evaluate them as a “safe” investment. Horror-based paranormal romances were once a risk; now they’re the sure thing. With science fiction romance, this dilution hasn’t taken place. The science fictional elements have a strong presence, and authors experiment with gender roles in their heroes and heroines. And yes, weird and fantastical concepts abound in these stories. So a second issue is that while the above factors are what keep SFR fresh, they also might hinder a higher rate of acceptance regarding submissions. It occurred to me that perhaps publishers are attempting to cast a wide net by using the term “paranormal romance” for submissions, but if writers are describing their work in terms of SFR or futuristic romance, what’s really the point? How would they necessarily know if paranormal means SFR/futuristic? I thought Cora’s statement was very thought provoking, and so I now turn the mike over to you. What do you think needs to change? Should publishers be more specific about their needs, or does everyone already know what’s being communicated? How should SFR authors label their stories when submitting? What might be an effective new umbrella term?